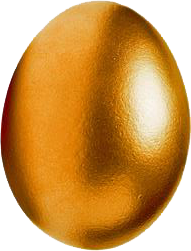 Significant Discounts are available for larger orders of this product. To order, please call 01902 623 256 between 9am and 3.30pm Monday to Friday excluding bank holidays. A 20% deposit is required to order. Prices are fixed over the phone to ensure we can provide you with today's best price on this item. 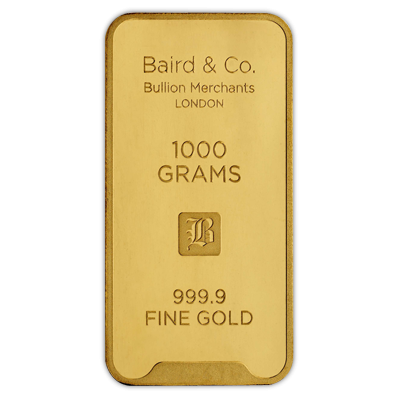 This 1 Kilo, 1000 Grams (999.9 fine) Minted Gold Bar is manufactured by Baird & Co in the UK. 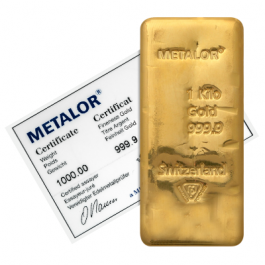 Each bar is certified for weight and purity. 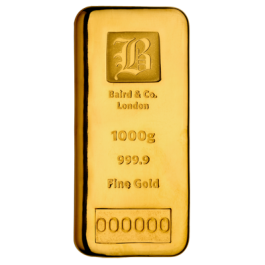 Free, fully insured UK delivery.